One of moodLearning's major service offerings is SerbizHub Suite, an integrated solution to woes in business inventory, sales, and accounting. A business need not bother embracing such kind of solution if its operations are small. A simple spreadsheet would do. But once its revenues hit north of 50 million pesos, the pains of tracking inventory and sales or of dealing with voluminous fanancial data would be hard to ignore. SerbizHub Suite (SS) consists of Inventory, Sales, Accounting, and other modules integrated and simplified for general use. It can be customized to suit particular needs of a business. Serbizhub Suite (SS) incorporates sales, inventory, and accounting functions. It helps manage purchase orders, invoices, accounts payable and receivable, inventories, payments, general ledgers, banking records. ...and so much more (except saving the world)! 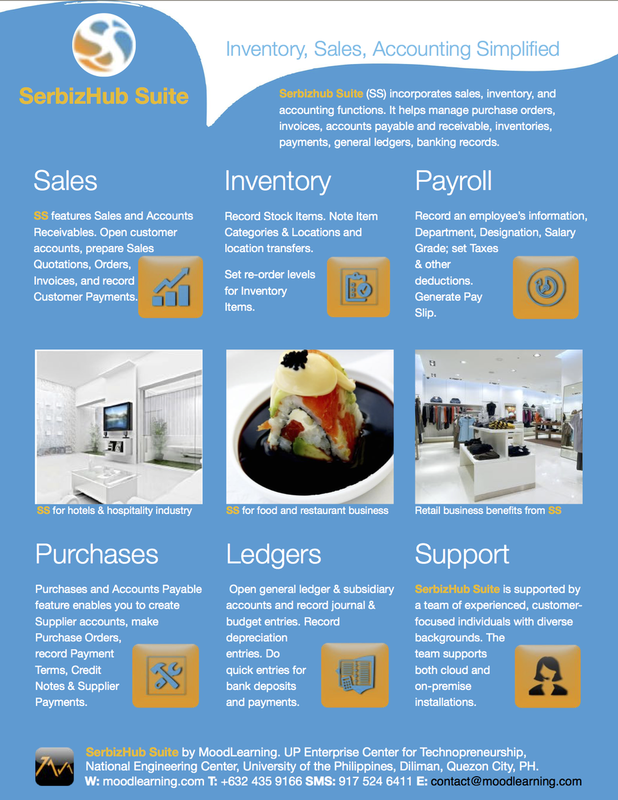 Know more about SerbizHub Suite.